Our campsite at Arher Beach on the far northeast side of Socotra. Here, a natural fresh water stream from the granite cliffs empties out into the crystal clear waters of the Arabian Sea. The winds have formed massive sand dunes hundreds of metres high between the ocean and the cliffs, that make for a dramatic climb to the top. In March, 2019 we became one of the first groups to return to the island of Socotra in the Indian Ocean, where we embarked on an 8-day expedition by jeep and foot across the island. Located off the coasts of Somalia and Yemen, this island is commonly referred to as the “Galapagos of Arabia” due to the large numbers of endemic flora and fauna. Over one third of Socotra’s plant species are unique to the island. The war in Mainland Yemen caused this island’s last significant remaining link to the outside world to be lost for about five years, but just this year it’s been possible to reach this fabled land once again. We are promoting responsible, sustainable, low-impact eco tourism on the island and are extremely happy to be returning here regularly. Interested in visiting Socotra? We can get you there. The Homhil Protected Area is one of only two areas on the island where the mysterious Dragon’s Blood Trees exist. These trees are endemic to Socotra and only exist on the island. They take hundreds of years to grow and sprout branches, as they begin their life as a small bush. This remarkable high altitude valley in the east of the island is home to not just the Dragon’s Blood Trees, but also numerous Bottle Trees, Desert Rose trees and Frankincense Trees. Eisa stands just in front of the sun as it sets on a sand dune in Zaheq. This patch of sand dunes on the south coast of Socotra was formed by constant winds that push the sand into rolling dunes along the coast line. You can hike for quite a distance and only see white sand dunes rolling all around you. A young Socotri boy sells Dragons Blood Tree resin in Homhil. The resin is said to have medicinal qualities for women, and can be used as a cosmetic. It’s bright red in colour, hence the name Dragons Blood. Nur, a Socotri bedouin goat herder from the Haggier Mountains stands within a toppled (dead) Dragon’s Blood Tree in the Firhmin Forest of central Socotra. A live tree can be seen in the background. The branches are spongy, fibrous and brittle. Nicole stands on a rock cliff overlooking the remarkable Detwah Lagoon. This sandy tongue jets out from the island into the turquoise waters of the Arabian Sea, providing a soft, enjoyable paradise for swimming in the crystal clear warm waters. Dragon’s Blood Trees grow from the rocky mountain face in central Socotra’s Haggier Range. For the first 30 some years of their existence, these trees resemble a small bush, before they begin to grow a trunk. Then, after an unknown amount of time they slowly develop branches. These trees are hundreds of years old and under threat. Since the introduction of goats to Socotra, baby Dragons are gobbled up and now only can be found in nurseries in significant numbers. The entrance to eastern Socotra’s Hoq Cave is nothing sort of spectacular. Massive, cathedral-like rock structures open up to the dry coastline. Inside the cave, it is not any less impressive. Stalagmites and stalactites reach several metres high as the cave opens up into numerous high ceiling chambers. Its actual length remains unknown, as there’s much to still be explored inside. An up-close view of the branches of a Dragons Blood Tree. Goats graze beneath them, as the trees provide shade, and curious looking bottle trees with their small sprouts of leaves and flowers lie just outside of their shadow. The rolling sand dunes at Zaheq on Socotra’s south coast meet the Indian Ocean. These dunes, formed by strong coastal winds, seem to go on forever. We even found a piece of ancient pottery in-between two of the dunes, as at one time this very well have been underwater. A Socotri elder takes a rest in his stone shelter in the remote Shu’ab region of far western Socotra. Accessible only by sea and hiking, Shu’ab is a remote community of Socotri bedouin who primarily raise goats. This man brings his herd to graze on the grasses along the coastline every day, drinking tea and smoking his tobacco pipe in his shelter before beginning the trek back to the village in the afternoon. The Ferhmin Forest has the highest concentration of Dragon’s Blood Trees on the planet— well, Socotra is the only place that has the trees. This forest, high in the Haggier Mountains of the middle of the island, is accessible by hiking down a deep wadi from the adjacent Diksam Plateau. Lying deep in the mountains and in-between the great wadis has kept this forest relatively safe and abundant. Fishmongers in Hadibo’s fish market prepare the morning catch for customers. Fish are a major source of food for Socotra’s 70,000 or so inhabitants and this market plays a major role in the local economy. 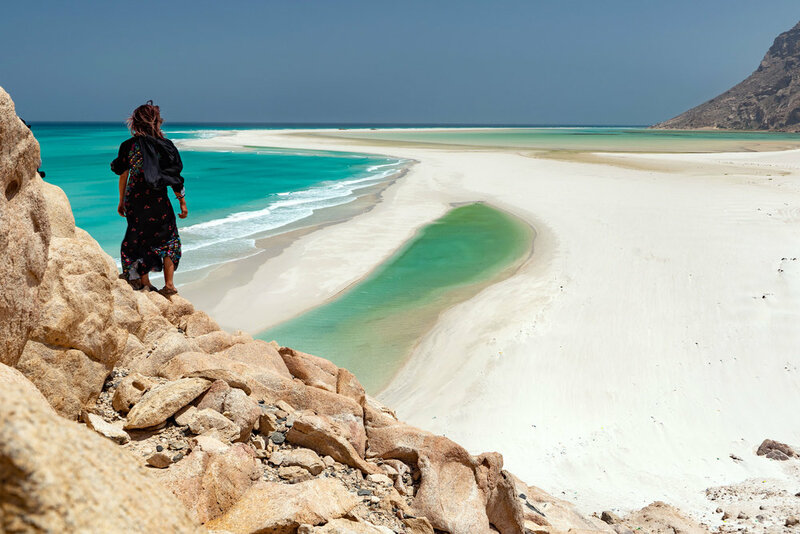 Socotra’s people come from several different ethnic groups— the largest being Socotris, originally from the Yemeni and Omani coast in south Arabia, but also several groups of sub-saharan African people have also inhabited the island for centuries. A Socotri Bedouin man takes a rest under the shade of a Dragon’s Blood Tree in the Ferhmin Forest. He is from this forest and has made his home from rocks on the mountain side. He does not hike in shoes, rather preferring to walk barefoot through the rocky forest as he watches over his goats. A Socotri man slides down a massive sand dune, several hundred metres high, at sunrise. 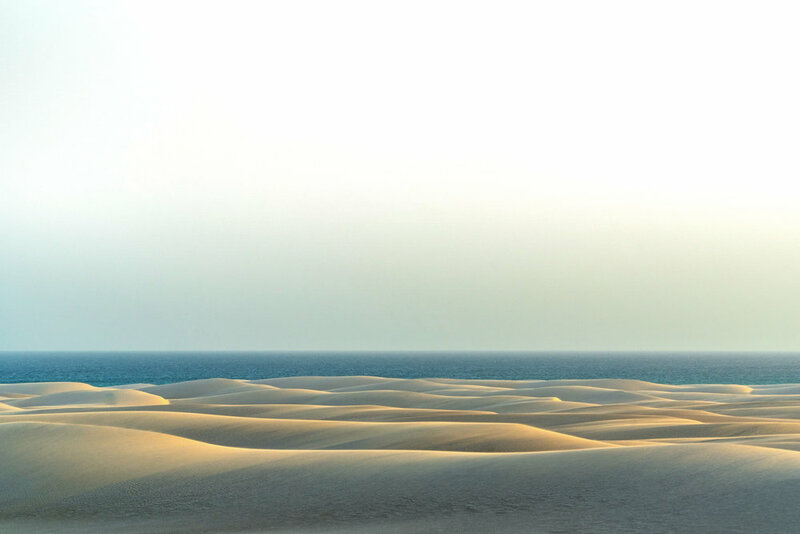 This dune, formed by strong winds between the northern coast and a giant granite rock face, is one of several great sand dunes that line northern Socotra’s coastline. A local villager leads his supply camel to a watering hole in the Derhur Canyon in central Socotra’s Haggier Mountains. This region, where the last roads were washed away by cyclones in 2014 and 2016, is only accessible by foot, so camels provided a much needed way of moving materials and supplies to remote communities in the mountains. A sole Dragons Blood Tree stands amongst Bottle Trees on a ridge line in the Haggier Mountains of central Socotra. These incredible trees only grow in two parts of the island, and as an endemic tree, that’s the only place on Earth where they may be found. Rolling sand dunes in high winds for the scenery at Zaheq, on Socotra’s south coast. These dunes look like a piece of art, constantly shifting with the winds. A group of young Socotri men ride around the coast on their motorcycles. Note the Emirati flag on the bike on the right; the UAE and Saudi Arabia have been providing aid and reconstruction projects on the island since the war in Yemen started, including a UAE military base. While certainly not a full “take over”, the UAE flag can be seen all around the island, along with the flags of Yemen and the former flag of South Yemen. Hikers climb up a small sand dune in Zaheq during golden hour for a better view of the the surrounding landscape. Sunset time is the perfect time to visit the sand dunes, as the sun is less strong and thus making the sands cooler on the feet. The view from near the top of one of Arher’s great sand dunes. It was a gruelling hike up several hundred metres of soft, slippery sand, and my legs felt like they were on fire by the time I reached the top, but it was worth the hike up for views like this.